FACT: A very short plant with yellow flowers. 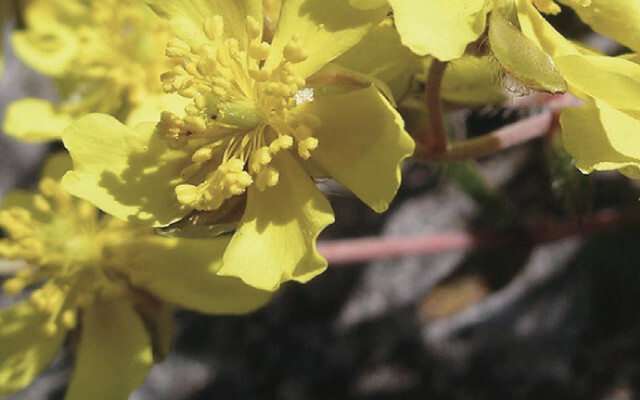 Helianthemum oelandicum, commonly called hoary rockrose, is a low growing plant confined to rocky dry calcareous areas especially close to the sea. The plant typically has a central stock from which numerous branches radiate horizontally or ascending. Stipules are absent and the small leaves (about 10mm long) are simple and green above but densely hairy and grey below which is a distinguishing characteristic in areas where H. nummularium is also present. The yellow flowers have 5 petals, free at the base and 5 sepals in cymes generally with 1 to 6 flowers in each cyme.